Cf. a jardiniere of this type illustrated in Sekai Toji Zenshu, vol. 15, Japan, 1983, pls. 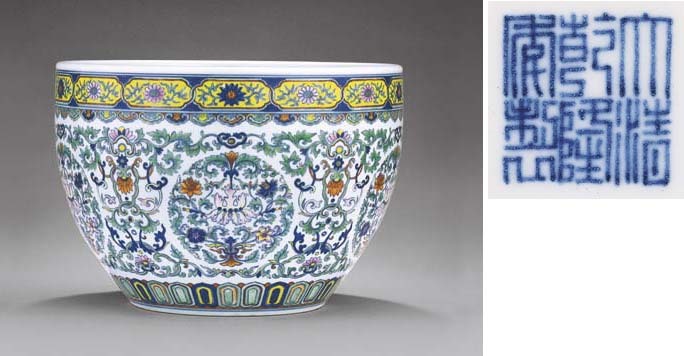 94 and 95; one in the Shanghai Museum, illustrated in Selected Ceramics from the Collection of Mr. and Mrs. J. M. Hu, Shanghai, 1989, pl. 68; and another in the Osaka Museum, illustrated in Ming and Qing Ceramics and Works of Art, no. 191. Other examples have also been sold in these Rooms, 2 May 1994, lot 696, and 30 April 2000, lot 528.